I am pleased to announce changes to HDRO’s visibility online with the rollout of a revamped website. Last year HDRO set out a new web and digital strategy with the objective to diversify our digital products and services, and reach wider audiences. These strategic alignments resulted in increased growth of our digital audiences. We introduced several innovative visual products and compelling graphics. We launched the report’s microsite which was visited by more than 600,000 readers. The app exceeded engagement expectations with over 4,000 downloads and received recognition by high-level stakeholders and peers. E-book version of the report and animations were equally successful. The new website is simpler, contemporary, user-friendly, mobile-responsive, and easier to navigate. It features improved structure of key human development content, so that visitors can get more information in shorter visit time. It introduces a new section on “Data Stories” with the goal to engage, inform and inspire audiences on applications of human development data, indicators and indices. 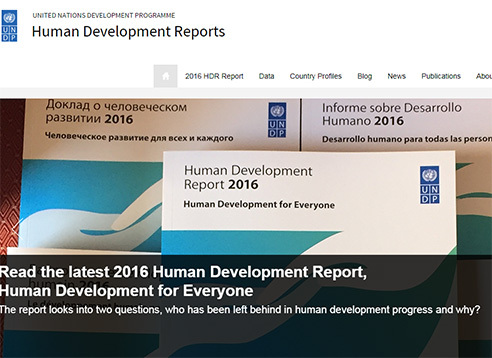 The new platform has a five-part front page slider which will highlight key human development content including the latest global report, human development index and data, latest digital products and offerings, and announcements from high-level meetings and launch events across the globe. The news section now added is where visitors can find more about latest events and updates. The blog and other resources will still be easily accessible with a single click. To keep up with our peers and technological advancements in the industry - special emphasis was given to a mobile-friendly platform and the new site represents a significant improvement in user experience for our growing mobile visitor base. Going forward we will continue evolving the site with improvements including a major restructuring of our ‘Data Tools’, ‘Country Profiles’ and ‘About’ sections and some interesting new content including interactive dashboards.